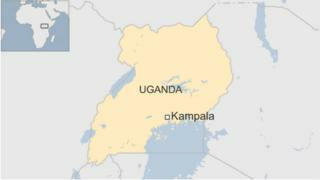 At least 30 South Asians stranded in Uganda by suspected traffickers are preparing to return home, police say. The tickets for about 10 Indians and 20 Bangladeshis are being paid for by their families and embassies are helping with new travel documents. Some of the group told local media that they were promised jobs in other African countries, with Uganda only intended as a stopover. The authorities are tracing a further 70 people caught up in similar scams. Police have already arrested the wife of the main trafficking suspect for involvement in one of the the alleged scams. They are looking for three further suspects, who have gone missing. Members of the Indian group told local media that they each paid between $2,000 and $2,500 (£1,300 and £1,600) as part of their deal with the alleged trafficker. Uganda's capital, Kampala, was only supposed to be a stopover before they headed to take up jobs that had been promised in other African countries like South Africa, Sudan and even South Sudan, which is currently in the midst of a civil war. When the alleged trafficker and his associates disappeared more than two months ago, the group were left stranded without passports or travel documents and without enough money to foot the mounting hotel bills they had racked up. The BBC's Patience Atuhaire in Kampala says the group of Bangladeshis were discovered in July, although it is not clear how long they have been in Uganda. The suspects will face charges of "people trafficking, obtaining money on false pretences and forgery," Moses Binoga, the police commissioner in charge of the country's Anti-Human Trafficking unit, told the private television station NTV.